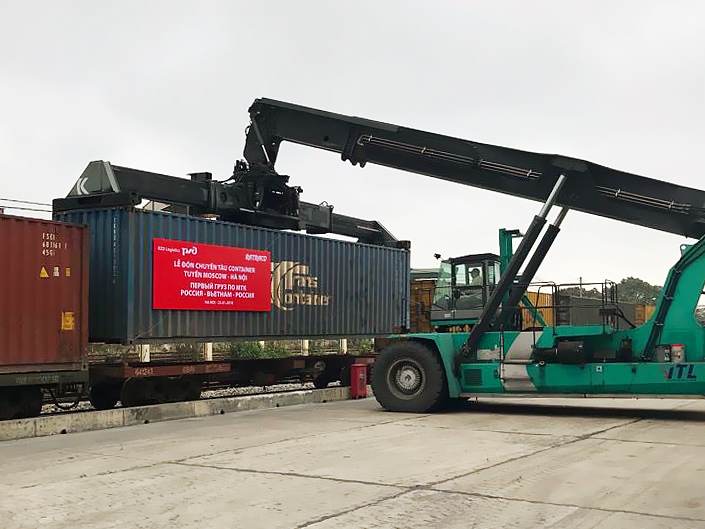 JSC RZD Logistics in partnership with a Vietnamese operator Ratraco (logistics company, 35% of which belongs to Vietnam Railways) organized a test railway shipment from Russia to Vietnam. 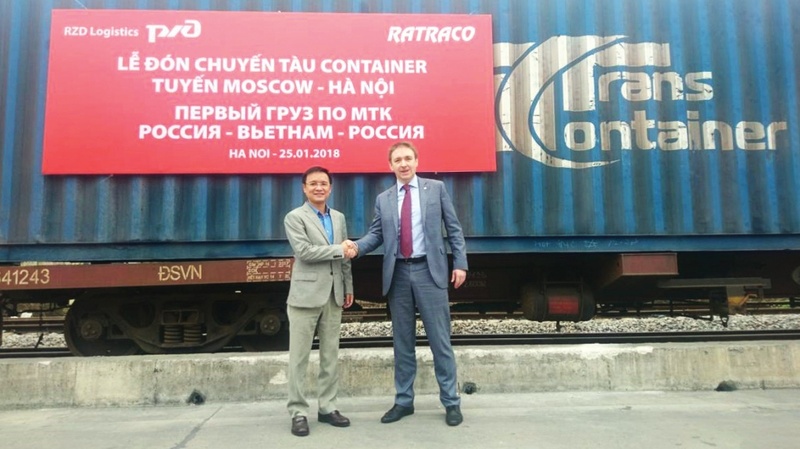 This shipment is part of a plan on performance of the agreement between Russian Railways and Vietnam Railways on bilateral cooperation and marks the launch of international transport corridor Vietnam-Russia-Vietnam. Container with cosmetic products of Russian company “Red Line” departed from Freight Village Vorsino (Kaluga region) as a part of container train and arrived in Hanoi on January 23. Overall time of the cargo railway shipment was 20 days. A standard shipment by sea would have taken twice as much time. The cargo included shampoos for grown-ups and children, soap, shower gels, various scrubs, creams and masks for face and hair. RZD Logistics was responsible for the general organization of this multimodal transportation, in short time provided auto and container (belongs to PJSC TransContainer), which was loaded with products in the warehouse of the consignor. RZDL also organized the transportation of cargo to a railway station and freight forwarding across the territory of Russia. RZD Logistics’ subsidiary Far East Land Bridge received the cargo at Manchuria-Zabaikalsk border point and supervised the transportation across the territory of China. Ratraco operator controlled the final stage of the transportation across the territory of Vietnam. Timely and high-quality implementation of all stages of the project (from the route development to the search of a client and partners) became possible due to the RZD Logistics’ competencies, which make it the only operator with the experience required for the launch of an international level service, in particular, international transport corridor. The transport solution offered by RZD Logistics has several advantages for consignors, including short delivery time, “one window service” and guaranteed safety of cargo. “We have made the whole way from the idea to its implementation in a short time thanks to the efforts of our high-class specialists, who invested lots of their time and effort into this project even during New Year holidays. We are happy to make our contribution to the development of trade relations between Russia and Vietnam, especially in such important sphere as export of Russian goods with a high added value”, – commented CEO of JSC “RZD Logistics” Viacheslav Valentik. “We have been exporting our products for 15 years now and since recently have been actively working on Asian markets. “Red Line” cosmetics is popular in the CIS region and Baltic countries, as well as in European, Arab and Asian states. This shipment was organized in order to coincide with the opening of our shop in Hanoi. The South-East Asia market potential is very high – it is growing year by year, with offering us wide range of opportunities for future cooperation. Asia is a very diverse continent from many points of view: this refers to the wealth of its citizens and infrastructure development. Asia is heavily-populated, which opens great export perspectives for various goods, including our company’s products”, – said Director General of “Red Line” LLC Svetlana Marakhovskay.